Ham Radio News: A great piece of software that will make your old TRX sound like a full-fledged new one! A great piece of software that will make your old TRX sound like a full-fledged new one! A few days ago I was reading a write up o' mine about some contest enrties from LU4DX that I did in the past. When I first visited Juan Pablo's station he had an Icom IC 736; he mostly used on SSB and digital modes, but the rig was lacking CW filters. The station is located in the middle of the city (Chivilcoy) in western Buenos Aires. So you can imagine it's a pretty noisy place. First time there on 10 meters ( CQ WW CW 2003) I had the chance to use an external DSP filter (MFJ-784B) which really helped a lot overcome the noisy bands. Contest went pretty well and the narrow DSP filtering as well as the noise reduction options made me feel very comfortable. In 2005 I returned to LU4DX's shack to enter CQ WW CW on 21 Mhz. My surprise was big, when I saw the MFJ filter was no longer there. 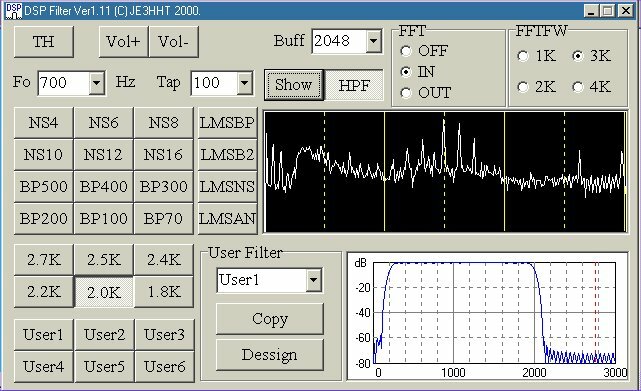 A quick search on the internet led me to the DSP software developed by Makoto Mori JE3HHT. Juan Pablo had the rig interfaced to the PC sound card so the wiring was ready. All we had to do was to install the soft and start testing. The soft was a life saver! I couldn't otherwise have operated comforatbly without it. It allowed me to practically reduce the noise to almost zero throughout the contest and it was great at narrowing the audio too. I remember tailoring the settings till I achived a very narrow bandwidth which was really helpful when digging for very weak signals. It was a great experience and it taught me that not always big bucks make the difference when it comes to RX performance.